Introduction: Food poisoning is an acute gastroenteritis caused by ingestion of food or drink contaminated with either living bacteria or their toxins or inorganic chemical substances and poisons derived from plants and animals, commonly occurring as explosive outbreaks. The authors investigated an outbreak of food poisoning reported from a working men's hostel in urban area of Pune, Maharashtra. Materials and Methods: A retrospective cohort study design was adopted to investigate the outbreak. Of the total 170 members, 68 had symptoms of food poisoning. Remaining 102 unexposed members were also interviewed as part of the study. Data for environmental and laboratory parameters were also collected. Results: The point source outbreak indicated cooked chicken as the source with a risk ratio of 3.34 (95% confidence interval: 2.02–5.54) and attributable fraction for chicken was 75.3%. As is the case with 70% of food poisoning outbreaks, laboratory confirmation of causative organism could not be established, due to lack of specimens. However, the clinicoepidemiological profile of the patients displays a median incubation period of 8 h (range 5–17 h), along with the clinical symptomatology of a self-limiting disease of diarrhea, abdominal cramps, and nausea; suggested the implicating organisms to be either Clostridium perfringens or Bacillus cereus. Conclusion: The defaulting environmental parameters of compromised sanitary conditions, inadequate storage in refrigerator, improper storage of raw food, and unsafe cooking practices were enhancing factors, which need to be mandatorily addressed in bulk cooking. Food poisoning is an acute gastroenteritis caused by ingestion of food or drink contaminated with either living bacteria or their toxins or inorganic chemical substances and poisons derived from plants and animals. It commonly occurs as explosive outbreaks, affecting large number of persons at the same time, with clustering of signs, symptoms, and history of a common exposure (meal). Food poisoning outbreaks have been mostly documented in places where food is prepared and served centrally for a group of people, i.e., hostels, old age homes, prisons, residential schools, hospitals, ships, and armed forces establishments, etc.,,, The common bacterial organisms implicated are Staphylococcus aureus and Bacillus cereus (incubation period 1–6 h); Clostridium perfringens and B. cereus (diarrheal toxin) (incubation period 8–16 h); Vibrio cholerae, enterotoxigenic Escherichia More Details coli, enterohemorrhagic E. coli, Salmonella More Details, Campylobacter, Shigella, and Vibrio parahaemolyticus (incubation period >16 h). We investigated an outbreak of food poisoning reported from a working men's hostel in urban area of Pune, Maharashtra. The aim of the investigation was to describe the outbreak, identify the probable cause, and recommend measures for the future prevention. We used the retrospective cohort study design to investigate the outbreak. A case was defined as any member of the hostel reporting with onset of symptoms of diarrhea with/without abdominal cramps, between 16:30 h on June 04, 2016 and 08:00 h on June 05, 2016. One hundred and seventy of the 184 members of the hostel had dined in the facility during breakfast and lunch on June 04, 2016. A total of 68 members of the hostel fulfilled the definition of cases which either reported to the medical facility or were identified during search for additional cases. One hundred and two members of the hostel who did not fulfill the criteria for a case and had dined in the same facility were also interviewed. None of the members declined to be interviewed. Details of their food history were taken to identify the suspect food. Epidemiological investigation included line listing of the cases – with personal, clinical, and environmental data recording. The investigation was initiated within 4 h of the first case reporting. Detailed history was recorded from all individuals who had dined at the dining facility. We calculated food-specific attack rates and risk ratios (RRs) for all food items of the suspect meal (lunch). The minimum, median, and maximum incubation periods were plotted on the epidemic curve to identify lunch as the suspect meal. All items consumed during lunch were listed, which included rice, roti, chicken, rajma, gobi, paneer, raita, and also drinking water. Samples of rice, roti, rajma, chicken, paneer, and raita were not available, hence could not be taken for bacteriological analysis. Samples of drinking water and 7 stool samples were taken for the bacteriological analysis. Out of 184 persons residing in the hostel, 170 had consumed the suspect meal on June 04, 2016. The age of members ranged from 21 to 48 years. 68 members of the hostel met the case definition, with an overall attack rate of 40%. The index case had onset of symptoms at 17:30 h on June 04, 2016. 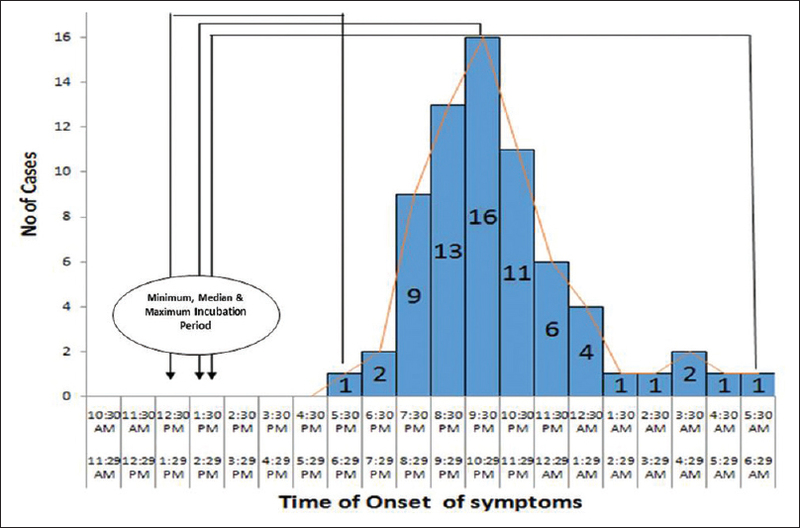 The time distribution of the outbreak suggests a point source epidemic, with peak onset occurring at 21:30–22:30 h on June 04, 2016. 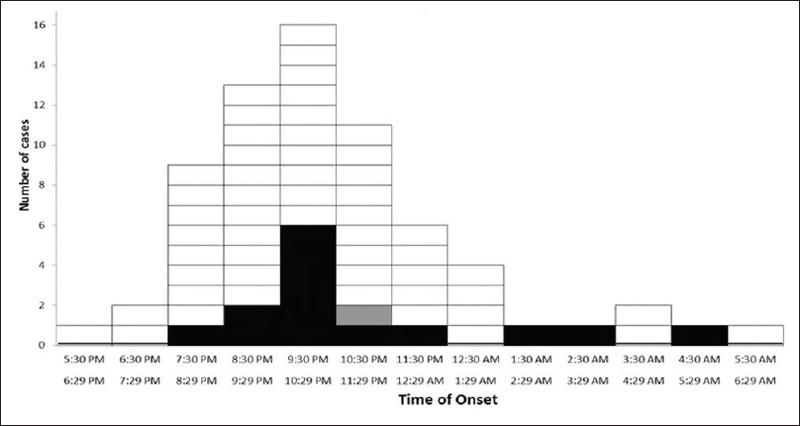 The median incubation period was found to be 8 h [Figure 1]. Majority of the cases (49 cases) reported to the medical facility starting at 17:30 h on June 04, 2016 till 06:30 h on June 05, 2016. The remaining were identified during the search for additional cases, since they had minor symptoms not warranting medical review 14 cases required hospitalization on reporting. They were discharged by the evening of June 05, 2016. One case was hospitalized for over 2 days due to associated dehydration [Figure 2]. The main clinical presentation in cases was diarrhea (100%), abdominal cramps (61.76%), and nausea (4.12%). None of the cases had fever and vomiting [Table 1]. The results of the retrospective cohort study are presented in [Table 2]. The highest RR among the items consumed was for chicken (RR = 3.34, 95% confidence interval [CI]: 2.02–5.54). The attributable fraction for chicken as cause of the outbreak was 75.3%, thereby explaining that 75.3% of illness in those who ate chicken was due to their eating the chicken dish. Due to delayed onset of monsoon, the weather in Pune was hot and dry, with ambient temperatures for the week ranging between 42°C (max) and 20°C (min); relative humidity ranging between 30% and 55%. Eight food handlers were examined for personal hygiene, pustules, wounds/cuts, and history of past illness. All food handlers were being medically examined on a bimonthly basis. However, no food handler wore aprons or caps while cooking or dispensing food. Water from the mess and hostel was checked for free chlorine (which was present) and sent for bacteriological sampling to reference laboratory. The overall hygiene and sanitation of the kitchen were unsatisfactory. The dry and fresh food was being stored together, without proper containers. Refrigeration was grossly inadequate, with the existing 200 L refrigerator overstocked with dressed chicken, to be cooked next day. One shelf in the fridge had packets of milk. The yoghurt was being set and stored outside the fridge, due to inadequate space. There was no space to store leftover food in the refrigerator and was being kept outside. However, as per food handlers, leftover food was disposed of and not consumed again. There was rat and cockroach nuisance in the cooking area. The washing facility was inadequate with improper drainage and water stagnation. On June 04, 2016, chicken stored in the refrigerator was removed and cooked for lunch, in the morning itself, at 07:30 h and kept in the kitchen. It was mildly reheated before serving at lunch at 12:30 h. Out of the 14 patients whose stool samples were sent for bacteriological analysis, 9 samples yielded E. coli. Bacteriological examination of water samples from location also did not yield any growth. In the present outbreak, lunch on June 04, 2016 was the common meal responsible and the gravy chicken dish is the food item implicated for occurrence of symptoms, with a highly statistically significant relative risk of 3.34 (95% CI: 2.02–5.54). The clinicoepidemiological profile of the patients displayed a median incubation period of 8 h (range 5–17 h). Along with the clinical symptomatology of a self-limiting disease of predominantly diarrhea and abdominal cramps, it suggested the implicating organisms to be either C. perfringens or B. cereus gp. 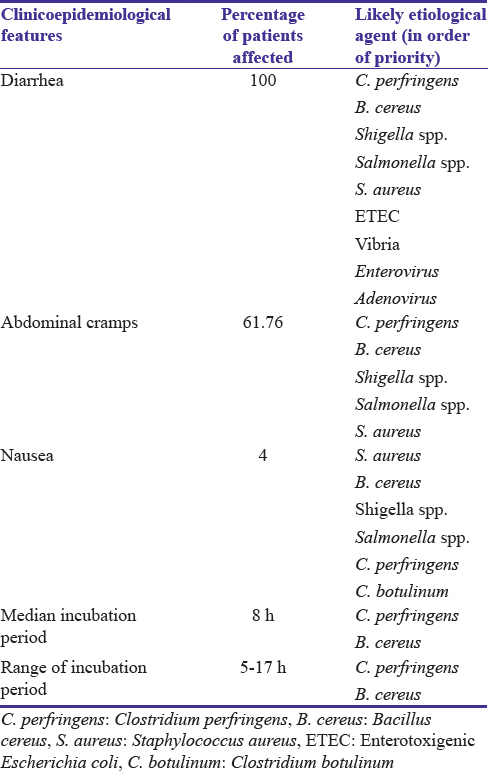 Based on the presenting clinical features of predominant diarrhea and abdominal cramps and no vomiting we suspected either B. cereus (diarrheal toxin) or C. perfringens, both having a median incubation period ranging from 6 to 18 h; to have caused the outbreak. As far as B. cereus is concerned, the type which produces diarrhea, mimics C. perfringens in its presentation of a self-limiting diarrheal disease, as also is transmitted by either contaminated milk products, vegetables, or meats. Diarrheal symptoms are due to production of heat-labile enterotoxins. A study done by Sudershan et al. stated that S. aureus and B. cereus were the most common organisms isolated from street poultry food. In another study by Tewari et al. reports incidence of 27.8% and 35% of B. cereus from meat and meat products in India. Many outbreaks implicating B. cereus have been reported in 1980, 1987, and 1995. The authors have investigated a food poisoning outbreak, which are common occurrences in places where food is cooked in bulk. Although the incriminating organism could not be isolated, owing to lack of appropriate samples, the clinicoepidemiological evidence points toward two organisms; C. perfringens and B. cereus. However, the outcome of this investigation revealed that whenever environmental conditions of food storage, handling, cooking, and distribution are compromised, as was in this outbreak; there is a high probability of contamination and explosive outbreaks. It is imperative that constant and due attention be given to all processes involved in bulk food handling. Bhalwar R. Public Health and Preventive Medicine for the Indian Armed Forces. 8th ed. Pune: Dept of Community Medicine AFMC; 2008. Park K. Park's Textbook of Preventive and Social Medicine. 24th ed. Jabalpur: M/S Banarsidas Bhanot; 2017. Tewari A, Abdullah S. Bacillus cereus food poisoning: International and Indian perspective. J Food Sci Technol 2015;52:2500-11. Gross TP, Kamara LB, Hatheway CL, Powers P, Libonati JP, Harmon SM, et al. Clostridium perfringens food poisoning: Use of serotyping in an outbreak setting. J Clin Microbiol 1989;27:660-3. Monma C, Hatakeyama K, Obata H, Yokoyama K, Konishi N, Itoh T, et al. Four foodborne disease outbreaks caused by a new type of enterotoxin-producing Clostridium perfringens. J Clin Microbiol 2015;53:859-67. Kunwar R, Singh H, Mangla V, Hiremath R. Outbreak investigation: Salmonella food poisoning. Med J Armed Forces India 2013;69:388-91. Srivastava RK. In: NCDC, editor. Food-Borne Diseases. New Delhi: Director, National Centre for Disease Control; 2009. p. 12. Lynch M, Painter J, Woodruff R, Braden C; Centers for Disease Control and Prevention. Surveillance for foodborne-disease outbreaks-United States, 1998-2002. MMWR Surveill Summ 2006;55:1-42. Shandera WX, Tacket CO, Blake PA. Food poisoning due to Clostridium perfringens in the United States. J Infect Dis 1983;147:167-70. Juneja VK, Novak JS, Labbe RL. Clostridium perfringens. In: Juneja VK, Sofos JN, editors. Pathogens and Toxins in Food; Challenges and Interventions. Washington DC: ASM Press; 2010. p. 53-70. Brynestad S, Granum PE. Clostridium perfringens and foodborne infections. Int J Food Microbiol 2002;74:195-202. Lukinmaa S, Takkunen E, Siitonen A. Molecular epidemiology of Clostridium perfringens related to food-borne outbreaks of disease in Finland from 1984 to 1999. Appl Environ Microbiol 2002;68:3744-9. Adak GK, Long SM, O'Brien SJ. Trends in indigenous foodborne disease and deaths, England and Wales: 1992 to 2000. Gut 2002;51:832-41. Murray PR, Baron EJ. Manual of Clinical Microbiology. Washington, D.C.: ASM Press; 2007. Sudershan RV, Kumar RN, Kashinath L, Bhaskar V, Polasa K. Foodborne infections and intoxications in Hyderabad India. Epidemiol Res Int 2014;2014:5. Tewari A, Singh SP, Singh R. Incidence and enterotoxigenic profile of Bacillus cereus in meat and meat products of Uttarakhand, India. J Food Sci Technol 2015;52:1796-801. Chopra P, Singh A, Kalra M. Occurrence of Bacillus cereus in milk and milk products. Indian J Dairy Sci 1980;33:248-52. Ram S, Singh A, Kalra MS. Food poisoning outbreak caused by Staphylococcus aureus and B. cereus. J Res Punjab Agric Univ 1987;24:469-71. Singh B, Kulshreshtha S, Kappor K. A bakery product associated B. cereus food poisoning outbreak. Indian J Comp Microbiol Infect Dis 1995;16:151-2. Prasad VG, Malhotra MV, Kishore Y, Nagaraj K. Epidemiological investigation of an outbreak of food poisoning at a religious gathering in South India. Indian J Appl Res 2015;5:50-3. Mustafa MS, Jain S, Agrawal VK. Food poisoning outbreak in a military establishment. Med J Armed Forces India 2009;65:240-3. Jadhav SL, Sinha AK, Banerjee A, Chawla PS. An outbreak of food poisoning in a military establishment. Med J Armed Forces India 2007;63:130-3. Tauxe RV, Swerdlow DL, Hughes JM. Food borne diseases. In: Gerald L, Mandell JE, Dolin R, editors. Mandell, Douglas, and Bennett's Principles and Practice of Infectious Diseases. Edinburgh: Churchill Livingstone; 2000. p. 1150-65.